The designers and 3D printing experts have printed a skateboard that is 3D printed. California based professionals who are from the field of architecture came up with an idea during the UCLA Masters of Architecture program. This program gives the students complete freedom to use the 3D printers for their creativity and represent them in front of the other people. The 3D printing technology has printed the skateboard similar to the traditional skate board manufacturing methods. But the designs can never match the traditional manufacturing of the skateboard. Most of the skateboard making companies layers up seven layers of wood to make a perfect piece of the skateboard. The 3D printing team has used somewhat similar method to make the skateboard by printing layers together of the material. The team has been more focused on the design and geometries of the product. The designing team has made sure that each layer has some structure and unique graphic pattern. As per the creative ideas and innovation techniques the designer uses, there can be different structures and patterns printed on the skateboard. Customized designs and pictures can be printed. The 3D printing technology has benefited in a great way and has caused less wastage. He printer that was used to print this product was the Fortus 900 mc industrial printer in which the deck was printed in the ABS and has plans to print the next lot with the help of laser sintered nylon material. Both these materials are robust and flexible to make a perfect piece of toy. 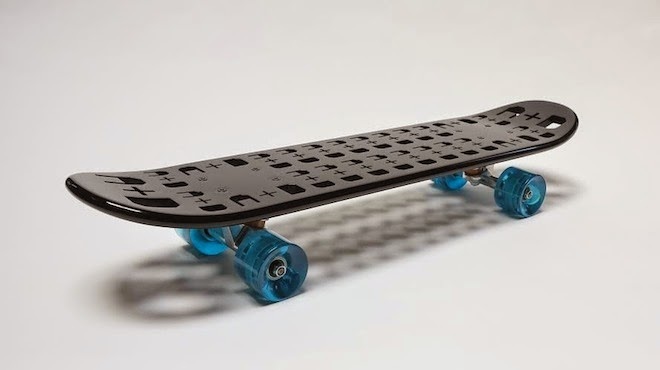 This functional piece of skateboard that is 3D printed is an unusual piece of skateboard manufactured in the recent time. The board would rather receive a lot of attention and praise as soon as it will hit the roads.